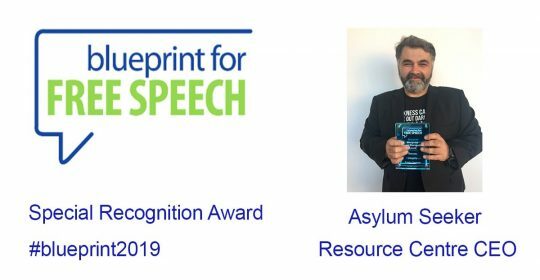 The Asylum Seeker Resource Centre has received a special recognition commendation from UK-Australian organisation Blue Print For Free Speech for our work in aid of of people seeking asylum held in offshore processing on Manus and Nauru. Whistleblower Dr Nick Martin, former senior medical officer for International Health and Medical Services on Nauru was awarded the prize for free speech for revealing concerns about patient conditions to the Australian media. The special recognition commended the whistleblowing work of the ASRC in 2017 and 2018 to expose the extent and severity of medical neglect and crisis. In 2017, the ASRC sent a team of three staff and a videographer to bear witness to the conditions on Manus Island, which included a late-night boat journey to access the detention centre. A report from the trip exposed the shocking living conditions and health deterioration due to neglect of treatable medical conditions of people being detained on Manus. In September 2018, an ASRC report documented the prevalence of repeated incidents of suicidality and self-harm in adults and children with rapidly deteriorating mental health who could not access proper medical treatment. The following month, 83 de-identified sets of medical records collated by the ASRC were used in a Sydney Morning Herald investigation exposing how medical advice recommending refugees be transferred to Australia, was being ignored by the authorities. The records demonstrated the severity of neglect and deterioration, with some adults waiting three or four years to be transferred for treatment, despite having a range of chronic medical issues including suspected cancer cases. And 17 records of critically sick children. “There has been enormous public pressure on politicians to find a solution to the crisis of offshore processing that has taken 12 lives, and will take more if we do not act now to get people urgent medical treatment,” Jana said. The ASRC is grateful to Blue-Print for Free Speech for recognising our work and will continue to campaign and advocate for the human right of medical treatment and a safe, permanent home for people seeking asylum. Blueprint for Free Speech is an Australian-European, internationally focused not-for-profit concentrating on research into ‘freedoms’ law. Areas of research include public interest disclosure (whistleblowing), censorship, right to publish, media law, Internet freedom and freedom of information. Blueprint has significant expertise in whistleblowing legislation around the world, with a library of analyses of more than 30 countries’ whistleblowing laws, protections and gaps.